The Government released the 2017 badger cull figures, just before the Parliamentary recess. Figures for the original Somerset and Gloucestershire zones will be published separately as these areas are running under new five-year supplementary licences. In 2016, 10 cull zones operated throughout the South West. In 2017 this number increased to 20 across our region, and for the first time, culling took place outside of the West Country with a zone running in Cheshire. Although 19,274 badgers lost their lives across the 19 zones running under four-year licences, this figure is nowhere near the almost 33,000 the Government had hoped for. Once again, four weeks in, DEFRA altered the targets by reducing the numbers for 10 of the 11 new zones and increasing for one zone. The Chief Veterinary Officer confirmed that ‘adjustments to the minimum and maximum numbers were made as the initial estimates were not supported by evidence on the ground once the culls were underway’. Maybe estimating badger populations by the mathematical formula Pn= A.Sn.B0. α isn’t such a great idea after all? However, this now appears to be the standard way for the Government to set the targets. Calculate the figures based on your own formulae. Then, as you near the end of the cull period, review the achieved figures and readjust the targets. Hey presto, guaranteed success! The data published so far shows that of the 19,274 badgers killed, 60% were killed by ‘controlled’ shooting and 40% by cage trapping and shooting. 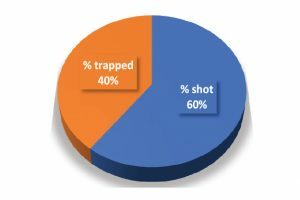 Without the figures for West Somerset and West Gloucestershire, these percentages may change, but for comparison, in 2016, 52% were killed by ‘controlled’ shooting and 48% by cage trapping. 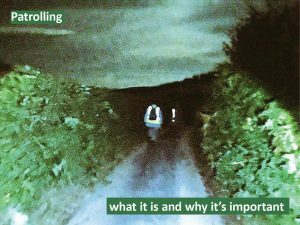 Whatever the final figures may be, what is clear is that there remains a role for everyone; patrollers, independents, and sabs. In 2017 of 19.274 badgers killed, only 74 kills were observed by official monitors. 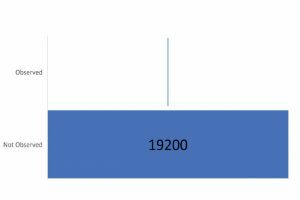 This chart proves just how ridiculous the Government’s claims that culling is ‘humane’ are. Of 19,274 badgers killed, just 74 (by ‘controlled shooting’) were observed. Of those 74, 8 ‘appeared’ to have been shot at and missed and 1 ‘appeared’ to have been shot but not retrieved. This ‘non-retrieval’ rate of 12.16%, if applied to all ‘controlled shot’ badgers, could mean that up to 1,415 badgers may not have been humanely killed. Once again, cullers have had to work very hard to achieve their kills. Last year the numbers for controlled shooting came in at under 1 badger shot per shooter night. This has remained unchanged this year. Cullers have, however, had to work even harder when it comes to cage trapping. Last year they killed just 0.04 badgers per trap night. This year’s figure so far comes in at just 0.03. Despite the Government’s efforts to make life easier for the cull companies, this doesn’t seem to be working. They’re still having to put in a huge amount of effort that is, of course, totally unnecessary.